Product prices and availability are accurate as of 2019-04-26 08:01:38 UTC and are subject to change. Any price and availability information displayed on http://www.amazon.co.uk/ at the time of purchase will apply to the purchase of this product. 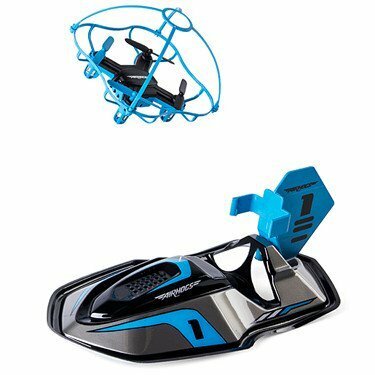 Race on land and Blaze across the sky with 2-in-1 Air Hogs hyper drift Drone! this RC Speeder, measuring 8" x 3" x 2.5", is both a land vehicle and flying Drone! powered by a Turbo Drone engine, it can achieve breakneck speed on the ground. When you hit a Roadblock, the detachable Drone ejects and soars away, continuing the race in the sky! hit the stunt button and see your Drone twist into a 360° barrel roll! even after a crash, your drone's self-righting cage ensures it lands upright, making it ready for the next take-off! race against the best using the Air Hogs 2-in-1 hyper drift Drone! for kids aged 8+. charges via USB. 4-Channel controller requires 2 x AAA batteries (not included).